James Kahn novelized Star Wars Episode VI: Return of the Jedi, Poltergeist, Indiana Jones and The Goonies and now he's turning his talents to making his own movie. James contacted us to tell us all about the Indiegogo crowdfunding campaign just launched to make the movie a reality. 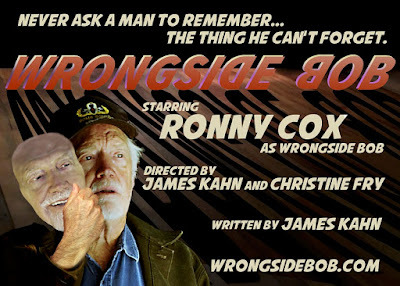 It's called WRONGSIDE BOB, a comedy/drama with music written by James Kahn himself. This is it! I'm making my own movie! After decades of getting other people's stories up on the screen (www.thatjameskahn.com), I've taken the scary leap into the abyss of my longtime dream - to write and direct my own film. Titled WRONGSIDE BOB, it's a comedy/drama with my music, about the masks we wear and the risk of exposing our inner selves. This story is close to my heart on many levels. All of which makes it hard to ask, but here it is: I need money to get my movie made. I'm extending my hand to you.